Tai chi is like any art, sport or devotion – the more you do it, the more you build up what the Chinese call ‘gong’ or ‘benefit from work.’ We don’t talk much in the West about someone’s having ‘gong,’ but most of us can recognize ‘gong’ when we see it – it’s that person doing something that looks effortless, simple and grace-filled. They can be cleaning their kitchen, moving through a yoga sequence, washing their car, lobbing a tennis ball, performing a pas de deux, or teaching in a way that elevates your heart and mind to understand a new principle. And ‘gong’ not only looks good, it does good. Having gong means that body, mind, spirit and soul are moving together in harmony on a regular basis, building up a resonance and a deep inner strength. This resonance produces steady breath, balanced moods, a quiet mind and a peaceful heart – all beneficial states in themselves, but moreover triggering, according to modern science, the self-healing response and thereby reducing the effects of stress. How to get this ‘gong?’ Daily practice. I’ve been practicing Taichi for over seven years and every day is a new day. When I go outside and prepare for practice, I am never the same person, mentally, physically, emotionally; my breath is not the same, the weather is not the same, and the world is not the same. Only the Taichi form remains the same and I do it and repeat it. Every day I practice, I learn something new about myself, the world, Taichi and others. Taichi talks about the principle of ‘stillness within movement and the movement within stillness.’ As I move through the form, a breeze stirs, my breath changes, a creature stops by to watch, the clouds dance and I am transported. I feel as though I am a still-point in the middle of a chaotic universe, even while I am in motion. No matter the resistance that comes up – to stay in bed, to sleep a little more – once I’m outside and in motion, the benefits reveal themselves and I am astounded and grateful. And then there are times when the daily practice feels disappointing – flat, dull, heavy and routine. That’s when I remember my master saying: ‘conscious practice, unconscious results.’ Even though I feel as if I have not advanced at all, that I am just a beginner after seven years, that I am fuddling and clumsy, I remember that I cannot judge my advancement. I bring my consciousness to my practice and the results will reveal themselves in time. I follow Daoist teachings regarding how I practice my Taichi. 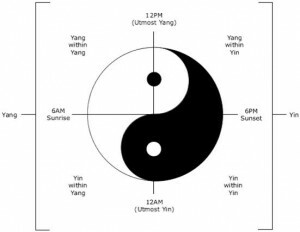 The Daoists have broken up the days and seasons into yin and yang. Yin being the feminine, dark, fertile, receptive, passive and yang being the masculine, light, dry, outgoing and active principle. The interplay of yin and yang are what creates the 10,000 things and so the Daoists revere the yin/yang symbol you’ve probably seen: a circle divided by black and white segments with a bit of black in the white and a bit of white in the black. This symbol is called the great Taichi. I have developed my own practice schedule to harmonize myself with heaven and earth: in the spring which is a growing yang season, I practice at dusk a growing yin time. In the Summer, a high-yang time, I practice at midnight a high-yin time. In the autumn, a waning yang time, I practice at noon, a high-yang time and in winter, a high-yin time, I practice at noon, a high-yang time. If this all sounds complicated, please know that this is my own schedule developed through trial and error. The only suggestion by the masters throughout the centuries is daily practice of Taichi in order to develop healing, balance and gong! Now, I’ve missed days of practice – I’m only human – but my intention to practice is always at the forefront. Try a 90 and 90 practice – practice for 30 minutes once a day for 90 days and see if you don’t notice you’ve got gong! I encourage you to find a good teacher and practice diligently. The rewards you will never lose and the benefits will grow over time. Jessica Sommar, is an author/instructor in Classical Yang Family Style Taijiquan and Daoyin at Kripalu Center for Yoga and Health in the Berkshires. She has trained in Daoist alchemy, Taijiquan fist and weapons forms and daoyin [yang sheng practices] and apprenticed in TCM — acupuncture and eastern herbs for six years, including living two years in Hangzhou, PRC. In the past two decades her training includes western herbs, western astrology, various energy healing modalities and she is a CPE-certified Interfaith Chaplain. 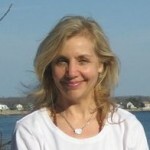 She recently graduated as a 200-hour certified Kripalu Yoga Teacher and works as marketing and administrative coordinator for the Kripalu Schools of Yoga and Ayurveda. Learn more about Jessica at her blog or from her Facebook page Jess’ Daoyin & Taijiquan at https://www.facebook.com/#!/pages/Jess-Daoyin-Taijiquan/112494282179657. This entry was posted in The Daily Daoist and tagged balance, daily daoist, daoism, Daoist, gong, harmony, practice, self healing, still, Stress, tai chi, yang, yin. Bookmark the permalink.